Donate your books and media to Friends! Each year we receive nearly a million donated books, which we in turn resell to the public through our Friends Bookstores and book sales. 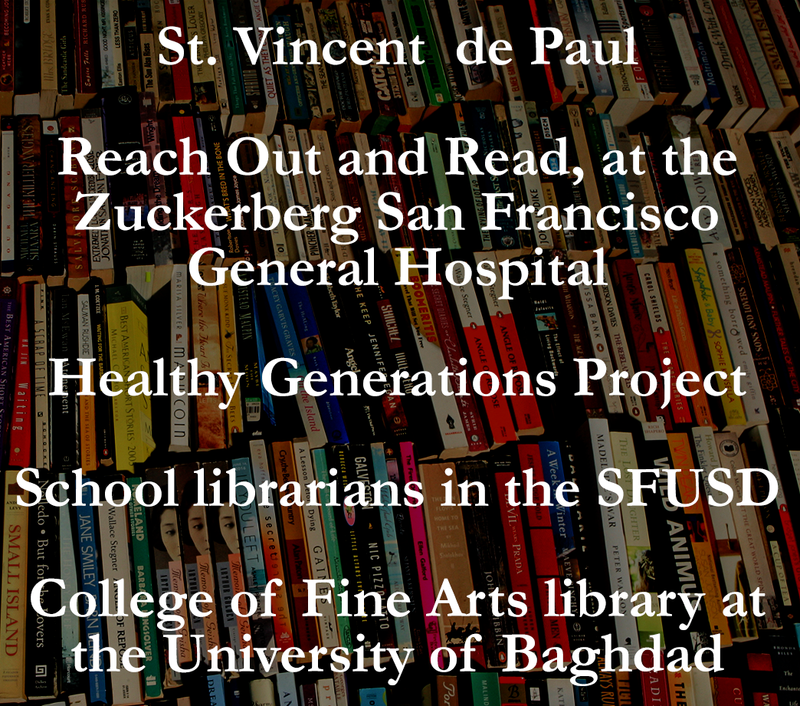 Your donation is tax-deductible and helps to provide critical support to the San Francisco Public Library and Friends’ community programs. ​Check out our two, year-round Friends Bookstores. We're located inside of the Main Library and in Fort Mason Center. Both stores sell quality books at great prices. Also check out our Special Events and Sales, our Online stores and our Big Book Sale! Every year, Friends’ iconic Big Book Sale is sponsored by over 100 individuals and businesses who all “take a stand” for libraries and literacy. Get exposure to over than 10,000 book buyers over five days. The 2019 BBS will be held at the Fort Mason Center from September 18-22nd. In September, Friends will fill up the Festival Pavilion Pier at Fort Mason for the 55th Big Book Sale, an iconic San Francisco tradition! The best way to recycle books and media is to put them to use in other ways. As the second largest used book seller in the city of San Francisco, we make sure your donations find new life in other peoples' homes. The Community Book Program (CBP) is a green reuse program diverting 550 tons of books from landfill every year to higher and better uses in the community. We also give books and media away to worthy community organizations.